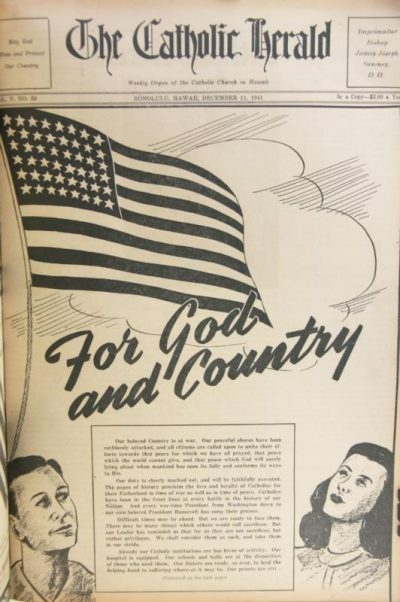 The smallest of editions, a single tabloid sheet printed front and back, the newspaper was a somber reassurance of the faith, resolve and patriotism of Hawaii’s Catholics. “Our duty is clearly marked out,” the editorial continued, “and will be faithfully executed. The pages of history proclaim the love and loyalty of Catholics for their fatherland in time of war as well as in time of peace. Catholics have been in the front lines at every battle in the history of our nation. And every war-time president from Washington down to our own beloved President (Franklin) Roosevelt has sung their praises. At the time of the attack, the diocese was only 3 months old. The newly installed Bishop James J. Sweeney was in California at the time, stranded with all commercial travel on hold, following his attendance of the annual U.S. bishops’ meeting in Washington. He was able to find a berth on the first troop transport ship to the islands and immediately took a role as chaplain, counselor and confessor for men headed for the battlefield. Later, it was speculated that the “bombs” were probably American anti-aircraft fire. “Already our Catholic institutions are bee hives of activity. Our hospital is equipped. Our schools and halls are at the disposition of those who need them. Our Sisters are ready, as ever, to lend the helping hand, to suffering wherever it may be. Our priests are striving to assist their confreres the noble chaplains of our armed forces. Everyone is anxious to render as much assistance as is humanly possible. “Thank God for our good Catholic people also who realize that we must not only work for peace, but must continue, nay redouble our prayers and self-denials. The kingdom of Heaven is said in holy Scripture to suffer violence, and we are reminded that it is the violent who bear it away. So we shall storm the heavens with our prayers while we do everything possible in the realm of material things to bring about what we all desire: Peace on earth to men of good will.